Village Theatre’s First Stage. Photo by Cole Good, 2015. Mr. Rufus H. Glenn came to Issaquah in 1912 and opened a theater in town. And in 1913 he built the Issaquah Theater Building (called Glenn Theater at the time) at this site where silent films were shown. The theater has a flat floor, and originally had removable seats to make room for other activities held in the building. Basketball games, school dances, and commencement exercises were some of the events which took place there. During the 1920’s when the coal miners were on strike, Mr. Glenn showed movies on Mine Hill to the strike breakers, or “scabs”, who didn’t feel safe coming into town. According to an Issaquah Press article, in July 1923, Mr. Glenn sold the theater to J.P. Devlin who renamed it the Issaquah Theater. Mr. Devlin made upgrades such as “installing opera chairs” and showed movies every night of the week. Sometime before 1932, John Brunberg bought the theater. Subsequent owners through 1977 were: Jim Brooks Sr. 1945-6; Keith Beckwith; Mr. Robert Catterall, who bought in 1967 from Mr. Don Rarey. Mr. Catterall remodeled the theater and turned over the management to Reverend Gray of Pine Lake Presbyterian Church. A board of seven persons was elected from the church to direct the theater as a non-profit organization called the Issaquah Theater Group. Volunteers from the church congregation cleaned and repaired the theater and offered their services selling tickets, running the concession and ushering. Funds from the theater went to the church, and a source of entertainment was provided for young people in Issaquah. After being closed for a time, the words “Unsafe-Do Not Occupy” adorned the front door of the building before it reopened in 1979 as the original home as the Village Theatre. 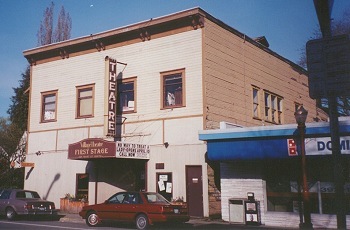 Now that the Village Theatre has moved into larger quarters at 303 Front Street North, this building is known as the “First Stage”, and is used for performances of the Village Theatre’s “Village Originals” series of plays. 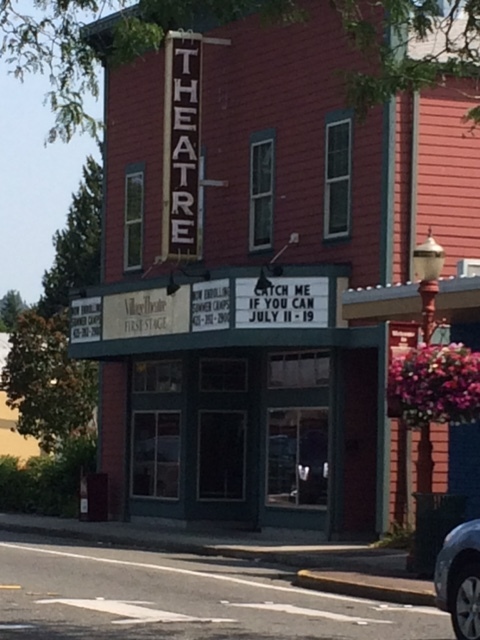 The Issaquah Theater is an intact example of an early pioneer wood frame commercial structure in Issaquah’s original downtown. It is a 2 story rectangular form with a low pitched front gable roof and a western plain false front at the street; the false front also runs along the south elevation. The front (west) and north walls are horizontal flush board siding with corner boards. The parapet is decorated with 5 pairs of decorative scrolled brackets and a wide cornice and frieze. The wide 1-over-1 double hung wood frame windows and trim are original on the front (west) and sides. The street level has been extensively renovated from the original. Village Theatre’s First Stage, prior to reconstruction. (Photo courtesy of David Bangs, 1999). In 2004, Village Theatre began what was intended to be a restoration of the building. Once work began, it was discovered that the original building was too far deteriorated to be restored. Instead, the building was reconstructed as a slightly wider version of the original building. Issaquah Historical Society files. King County historic survey completed by Kay Bullis, 1977. King County Tax Assessors records. Village Theatre promotional literature.